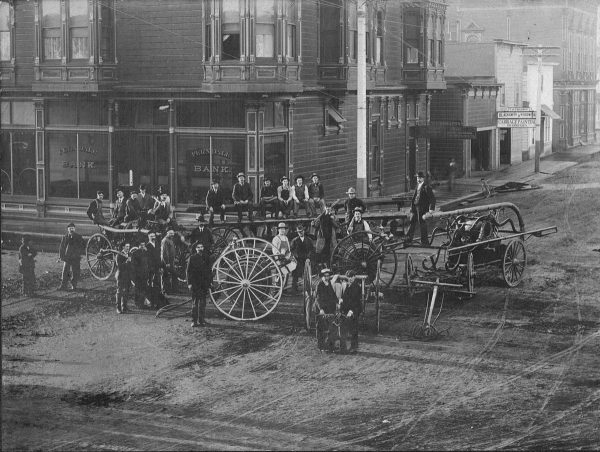 FVFD in 1905 showing the recently purchased Waterous Pumper. Bylaws for the department were drafted, and $21 was spent to have a secretary built by a local furniture maker. The department worked on getting a fire alarm installed for the town. In the meantime they used the church bells to signal the alarm. An inquiry was made to the R.S. Chapman company for a compressed air system to run the fire alarm whistle. R.S. Chapman is the company that sold the c.1890 Chemical Cart. With the department reaching its 5th anniversary in February, the department started looking into issuing exempt certificates to members who had been in the department since its founding. After numerous resignations in the position of secretary, the department started providing a monthly stipend of $2.50/month for the secretary. This seems to have had a positive effect. The department had a big celebration for Dewey Day, which was May 1st. Smokers and dances were the big fundraisers for the department. In July the fire bell (which is now installed on the FVFD annex building) was installed over Boynton & Hall’s store. This store, commonly known as the White Front Store, sat where the bank is now at the corner of Brown and Main. 400 signal cards were printed with the list of signal codes to be used by the town. These were distributed to the firemen and townspeople. In October, there was a fire at the Electric Light Co.
A house for Hose Co. 2 was completed, located between the Gilt Edge and Bartlett’s store. In September a new ladder for the Hook & Ladder Co. was purchased. It weighed 300 pounds and cost $75 at the factory. It was transported to Ferndale free of charge by the Steamer Argo. A new hose company was formed for boys between the ages of 16 and 18. They were allowed to get their hose cart to drills and fires. E.A. Aggeler went to San Francisco to obtain samples of exempt certificates and returned with several samples. The department decided to go with the cheapest ones. Members paid 50 cents to obtain the certificate once they had served 5 years with the department. In September, the department responded to a fire at Fern Cottage. The year started off with some voter fraud during the election of officers. They also decided to pay the treasurer $2.50 a month. After skipping the 4th of July celebration in 1904, they decided to participate this year, and bought uniforms for the members. The department receives its first piece of motorized equipment, the 1905 Waterous pumper. The old Hunneman hand pumper was kept as a backup. The minutes from 1906 indicate a normal year up to April, with the only big new was that the Boynton & Hall store failed, which is where the treasurer, C.H. Boynton, kept the department funds. Then of course the San Francisco earthquake hit on April 16, and for the rest of the year there was only one more meeting, as apparently everyone was too busy rebuilding the town. The town ordinance is amended to allow for a third hose company, so Hose Co. 3 becomes a legal company. By this point the members that were in Co. 3 were old enough to officially join the department anyways. Ferndale welcomes the Veteran Firemen of San Francisco who were in Humboldt attending a muster in Eureka. They are honored with free admission to the fair, a hose race, and lunch at the Knights of Pythia hall. At the beginning of the year both the Engine Co. and Hose Co. 3 were having trouble maintaining their membership. It didn’t help that the treasurer of Co. 3 also left with the company’s funds. The department’s past treasurer, C.H. Boynton, owed the depart $145.44 in department funds that were deposited with his failed store. With all the problems with treasurers, the department decided to elect the Ferndale Bank as their treasurer. A new engine house was built for the Waterous. The department was still discussing the pros and cons of a new fire alarm system. The minutes from 1909 don’t report much else, but it does seem like the department got infatuated with the tamales at Burrill’s, as they often adjourned there after the meetings.